Soak the dal for 1/2 hour. Soak the broken corn kernels in warm water for an hour. Grind the dal till smooth paste and then add corn kernels. Grind again for a few minutes. Add salt as required. Ferment the batter for 4-5 hours. Heat the tava and spread a ladle full of batter to make dosa. Put a few drops of oil and cook till crisp. Serve hot with side dish of your choice. * The batter is same like broken corn idli. Meet Sonia of Dinner recipes from Sonia’s Kitchen in the Budding Blogger series. I am freelance writer with zest for creating some good food. I was born in Chandigarh and since the time I have had basic sense to understand I have only heard praise for my mother’s culinary skills. She cooks some amazing recipes with simple ingredients available at home. No fancy colors or no fancy masalas. I think it is in the genes and I have definitely inherited some good food sense from her. Her advice has been that to cook good food you need to have patience and passion as she says in “Dil laga ke Khana banao” and it will come out good. My venture into food blogging was by accident. I was working in Gurgaon while being married to a software professional. When my husband got a job in Boston, I started doing some freelance writing work to help with the finances and also to keep myself busy in the US. It is while doing the freelance work I got several assignments to write recipes for food blogs. It is then I got the idea of starting my own food blog and of course mom helped. She has this list of 200 odd recipes which she has sent to me and told me cook and write on those. I am sure it is like Mom’s challenge and encouragement to me. Another plus with being a food blogger is that you can then make friends with some amazing food bloggers from India and other parts of the world that it is worth investing time and money into this. If you wish to make oil free parathas, use milk to make a soft dough of wheat flour and salt. Else you can use water to make the dough. Keep covered for atleast 1/2 hour. Heat the oil and add onions. Fry till it starts turning pink and then add cabbage and carrot. Fry for a few mins till soft and then add the soya sauce and red chilli sauce. Add a little bit of salt only as soya sauce already has salt. Mix well on high flame for 2 mins. The stuffing is ready. Make balls of the dough and roll into thick rotis. Place a little stuffing in the center. Gather the dough from the corners and cover the stuffing completely. Dust with little flour and roll again slowly to make a thick paratha. Heat the tava and place the paratha on it. Apply a little oil or ghee in the sides and cook till brown spots appear. Turn and cook on other side also. My name is Chitra Manoj, mom of 2 lovely boys. My native is Nagercoil (which is in South tamil nadu, but very near to kerala ). Thus our family recipes are greatly influenced from kerala and tamil nadu. My inspiration was my grandma and I loved to assist her in her cooking at a very early stage. So she taught me many family recipes and tricks...and thus the journey began...After marriage since me and my husband love to taste different food, I started to search for new recipes and thus started following few blogs. This inspired me to create my own blog and I enjoy blogging . The recipes in the blog are mainly from family and friend's recipes and some are inspired from other blogs I follow. I love to cook the traditional food and feel no other food satisfies our tastebuds like the food prepared by grandma and ma. Hence I try to keep the tradition alive. Cook with spinach without water for 2 mins, cool and grind to a fine paste along with the tomato. Heat oil and add cumin seeds. When it splutters, add the spinach and tomato paste. Allow it to cook for 2 mins and add salt, turmeric powder, red chilli powder and garam masala powder. Mix well and add the cooked legumes. Add water if required to get more gravy. Cook covered for 2-5 minutes for the flavours to get absorbed. Cut the parota into pieces by hand or using a knife. Heat oil, add the onions and capsicum and fry for 2-3 minutes. Add the coriander leaves, tomato sauce, garam masala powder, red chilli powder, salt (the parotas already have salt-so very little) and ajinomoto. Mix well and finally add the parota pieces. Mix well and serve hot with onion raita. Meet Shireen of Ruchik Randap in the Budding blogger series.. I am a SAHM (Stay-At-Home-Mom) with a passion for food. I love trying out new recipes and giving them a twist of my own wherever possible, but I often prefer to stick to the original recipe when I try it out for the first time..this gives me an idea of what the dish would have been like as conceived by its creator. Having learnt cooking pretty much on my own through experiments at every stage of my life, it was my husband's encouragement that helped me start my own food blog (Ruchik Randhap which means Delicious Cooking in Konkani) with the sole purpose of helping retain the culinary culture of Mangalore. The little known town called 'Mangalore' is a beautiful pot pourri of cultures & languages, food & religions and people from Mangalore will swear by its authentic cuisine. No matter where a Mangalorean has migrated to, he will dream of all things Mangalorean. With globalisation closing in on many small cultures, this is my small effort to popularise Mangalorean cuisine and make the recipes along with the pictures accessible to all. Being away from my hometown, I have tried many a dish purely out of recollection of vision & taste as it was being prepared in my Mother's kitchen many years ago. Put the chopped spinach in a vessel and heat it by covering it with a lid. In a few minutes, the spinach will get cooked and greener. Cool and grind it to a fine paste. Add salt and ajwain powder to the wheat flour, add the spinach paste and make a dough. Add water as required. Make small balls and roll them into pooris. Heat oil and fry them immediately. Serve hot with potato sidedish. Lakshmi : I am a pharmacist by education, working in research, in health care and hospital industry. I am mother of two boys, who keep me busy all the time after my work hours. Cooking is not new to me as I am cooking from the age of 15. At that age perhaps I did not understand the logic of using many ingredients but just followed amma's instructions and helped her in her chores. My mother and grandmother were good cooks. My mother was very innovative in her cooking methods and recipes. As her health worsened her memory also went for a toss so I could not learn much from her, but she was(/is/will remain) my inspiration. I faintly remember her tips for cooking, but the taste of her cooking cannot be forgotten! She was multi talented. She had a big craze for handmade bags. She made bags from wires using crochet, she made idols using beads, flowers with satin cloth, made dolls for Dasara and very creatively recycled dad's old pants. I learned light music and still love to sing them, art and craft and blogging are my hobbies. Meet Prathima of Indian recipes in this weeks Budding blogger series..
Hi, I am Prathima Shivraj, married to a loving husband Anand and live in Bangalore. I am a food enthusiast who enjoys cooking for my husband. My interest for cooking grew before my marriage , My mom is my first Guru in cooking. Luckily I got chance to learn Karnataka items also by observing my mother-in-law's cooking and also from my husband, and now I am cooking all Telangana, Karnataka recipes for my husband. This Blog is a humble attempt at sharing my passion for all things food and wanted to share easy, complex, traditional, tasty dishes that I cook. Roast the cashews till golden brown and keep aside. Heat 2 1/2 cups of water and when it starts boiling, add the rava and cook on low flame till rava is cooked and absorbs all the water. Keep seperate. Heat the jaggery with little water till it gets thick. Now add the cooked rava and cooked dal. Mix well. Add cardamom powder and mix well. Allow it to cool a bit and then add boiled milk. Mix well. Garnish with roasted nuts and raisins. 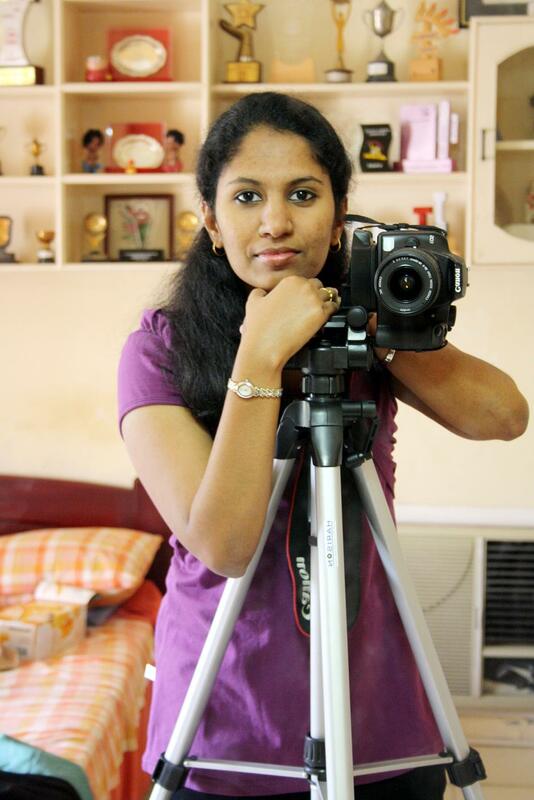 Meet Nithya of 4th Sense Cooking in the Super blogger series this weekend...Nithya started blogging around 2 years back and from then there has been no looking back..She is an excellent cook, a superb photographer and a very creative person. 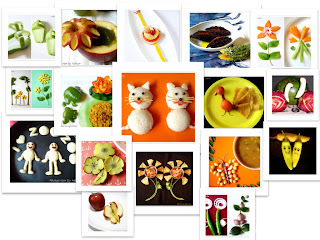 She garnishes the food in a very beautiful manner and combined with her photographic skills the food pictures are really very eye-catching..Read more about her as she shares some tips on garnishing, photography and baking..
Nithya: Hi All, I’m Nithya, software developer who turned into a blogger. I’m the blogger behind 4th sense Cooking. My blog child is going to be two in few weeks from now and I have thoroughly enjoyed the journey. I also have keen interest in arts, crafts and photography about which I blog under Nits Arts and crafts. Managing blogs does need quite some effort and the fruits of the effort show up through comments and readership. Isn’t that amazing when what we do is of use to a lot of people around the globe! I make it a point to post atleast a minimum of two posts a week. Now that I have completed around 270 recipes, I do a lot of research on new recipes and collect them from friends and relatives and give them a try. EC: Who and what inspired you to start food blogging?? Which food blogs inspire you? Nithya : My mom is my inspiration. She is the best cook I have ever seen. It all started when my mom asked me to copy down her cook book. Having an IT background, I really wanted to take it to the next step and so started a blog where I registered my recipes along with simple pictures. What started for a purpose has now become a hobby and in turn my passion as well. http://bakeinparis.blogspot.com/ etc. Love their food presentation loads. EC: The pictures on your blog are so beautiful. Give us some tips for good photography. Thank you EC for that compliment. I take immense interest in presenting my food in an attractive way and clicking pics of them. According to me, more than possessing a high tech camera, its all about having an eye for presentation and photography that is important. When it comes to food photography, the presentation is really important. 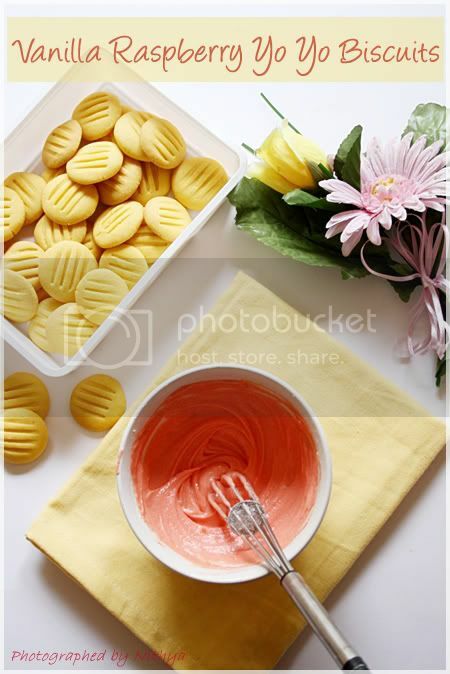 The photographs should invite the viewers to try the recipe. • Good lighting - this is the most important factor which makes the photograph look good. So make it a point you take photographs in bright lighting. • Clean set up – Never crowd the photograph with loads of properties and objects. Keep it simple and focus the attraction to the subject always. • Colors – Choose background and bowl colors that compliment the food. Nithya : Thank you again .. I’m totally on the learning curve when it comes to garnishing. The best way to decorate a food is to use the ingredients that are included in the dish itself. The raw materials can be displayed in a creative way. In general a lot of vegetables resemble animals or anything else for that matter. Just observe the shape of the vegetable and try to carve out or dress it up like animals etc. which would make the dish look very attractive. EC: How much technical knowledge does one need for successful blogging? Nithya : According to me not much of technical knowledge is needed for blogging. Blogger platform is absolutely user friendly and helps even a novice to blog without any strain. Wordpress is equally good too. Creating our own template or customizing the template would require minimal knowledge but loads of online tutorials are easily available for our rescue. Anybody can start off blogging without any fear. EC: You have a lot of baked goodies on your blog..Some tips for a newbie in baking and which recipe of yours would you suggest for a first timer. Nithya: Baking is fun and quite easy once you start off and has been my latest craze. The understanding of measurements and certain methodologies would make baking breezy. • Start off with simple recipes that help you gain confidence. • Measure the ingredients perfectly. Its best to have a set of measuring cups and spoons handy. • Freeze the dough for some time before you make cookies. This is really a magical step for neat looking cookies. • Never remove the cake or any baked goody from the oven just after you switch it off. Give it few mins standing time. This helps in good texture of the baked goody. • Make sure your baking soda, baking powder and yeast are fresh when you use them in bakes. They are the key to success.